Human Achievement Hour—to be observed tomorrow, March 24, between 8:30 pm and 9:30 pm—is the Competitive Enterprise’s Institute’s annual celebration of innovation and progress. However you spend the hour tomorrow night, remember that human technology and affordable energy are making life better for billions of people around the world every day—from life expectancy and disease treatment to literacy rates and increased employment. Throwing up barriers and restrictions in the name of protecting the Earth will slow down those improvements. The costs, especially to the poorest and most vulnerable, are real. This article originally appeared in the Austin American-Statesman on July 31, 1996. Without a doubt, the bomb that exploded in Centennial Olympic Park in Atlanta early Saturday was the work of an evil person with malicious intentions. A businesswoman was killed, and 111 others injured. Law enforcement officials are justified in using all legal means at their disposal to find and prosecute the murderer. It is, however, troubling that both law- enforcement agencies and the news media are treating this crime as as a terrorist event. Not all mass murders are acts of terrorism. Not all bombs are planted by terrorists. Terrorism is fundamentally a political act, to advance a cause. Terrorists mean to create tyranny, either directly or indirectly, so that the political order that they prefer can take the place of the current one. Terrorists can be rebels seeking to overthrow a state; states seeking to overthrow the international order; or states seeking to maintain privilege for rulers and stifle dissent among the people. In every case, the motivation for terrorism is explicitly political. Whoever planted the bomb in Atlanta was most likely a "lone wolf" who was seeking some sort of personal affirmation by seeing his morbid act reported on television and in the newspapers. He was no more a terrorist than Jeffrey Dahmer, whose murderous and cannibalistic behavior was disgusting and uncivilized, but had no political content. The danger of elevating the tragedy at the Olympics to terrorist status is that it will give the U.S. government more excuses to erode our constitutional liberties. Already this year a new terrorism law took effect which limits the rights of foreign nationals to appeal deportation proceedings; which grants the FBI and other government agencies broad new authority to listen to our telephone calls; and which limits the right of habeas corpus for those accused of capital crimes. In short, it shrinks the Bill of Rights to a skeleton of what it should be. Another new law, "justified" by the Atlanta bombing, might rip the guts out of our freedoms of association, dissent, and privacy. Real terrorism is when the Irish Republican Army takes a sledgehammer to the kneecaps of a suspected informer in order to enforce its will in a Catholic neighborhood. Real terrorism is when the Libyan government plants a bomb in a Pan Am jetliner that explodes over Lockerbie, Scotland. Real terrorism is when the U.S. government uses tanks to knock down the homestead of religious dissenters in Waco, resulting in the deaths of dozens. Real terrorism is when Palestinian gunmen kidnap and murder Israeli athletes at the Munich Olympics. It ill-serves us to redefine simple crimes as terrorism when the result is expanded government power and shrunken human liberty. Such redefinition also, in a perverse sense, glorifies the criminal when our goal should be shame and punishment. Let's not over-react to the Atlanta bombing. If we do, far more than 112 people will be harmed. Sincere is the author of "The Politics of Sentiment" and other works. What a study in contrasts! The Studio Theatre has shown its range this year, with two remarkably different yet similarly superior productions mounted since January. The Studio Theatre's first offering of 1996, Two Trains Running by August Wilson, was an ensemble production, in which various characters existed as parts of a larger whole. No single character stood out, with the result being a portrayal of a community. Flip this over by 180 degrees and you have the Studio's second major production of the year, Talking Heads by British playwright Alan Bennett. Not a play in the classic sense -- there is no plot, no action as such -- it is instead a series of four monologues, each delivered by a different actress portraying a different character. The absence of plot or action does not, however, mean the play lacks energy. Not at all -- it turns out to be gripping, moving, driving. The first monologue, "A Lady of Letters," is a lightly comic piece about a neighborhood busybody, Irene Ruddock (played by Nancy Paris), who has an insatiable appetite for writing letters -- complaints, compliments, criticisms. Irene seems not to have any other occupation but a combination of spying on her neighbors and writing -- in elegant longhand -- strange letters to anyone for whom she has a postal address. The second piece, "Bed Among the Lentils," is a powerful monologue about the wife of the local vicar, Susan (played by Jon Tindle). Of the four monologues in Talking Heads, this is the only one I had seen previously, when Dame Maggie Smith played the part on television. Smith and Tindle have created significantly different interpretations of the same role, yet both are powerful and emotive. Tindle gives us a cynical, boozy Yorkshirewoman who carries on petty jealousies about her priest-husband's "fan club" even as she pursues an affair with a local Asian grocer half her age. Tindle, who despite his age and gender makes a quite convincing middle-aged woman, pulls a star turn here. A short intermission precedes "Her Big Chance," featuring Vanessa Maroney as small-time actress Lesley, who's biggest claim to fame is appearing as an extra in a TV soap opera. Lesley could be one of Tracey Ullman's Emmy-winning characters. Although created, of course, by Alan Bennett, Lesley has the mix of confidence and naivete that defines much of Ullman's work. This monologue describes Lesley's experience "acting" in a film that everyone but she understands to be a cheap pornographic video. As an actress, poor Lesley may not get the parts she desires, but she does get to see the insides of many producers' bedrooms. The final piece, "A Cream Cracker Under the Settee," is the most poignant of the four. Elderly, widowed Doris (June Hansen), who insists on living on her own despite offers by the local social worker to give her a place in a pensioners' home, has just injured her leg while cleaning her house. The sun is setting, and no one is scheduled to visit for several days. Dragging herself across the room, Doris yields to the inevitable as she reminisces about her late husband, their inability to have children, and the nosy social workers who intrude on her life. All four of these women are from Yorkshire, England's moral equivalent to Texas. As such, they each have a special pride that breaks through the darkness of their lives. Bennett wrote Talking Heads during the Thatcher years, a time in recent British history in which the North/South divide was very strong -- Thatcher's policies had the effect of ginning up the economy in the South, in and around London, while the North (places like Liverpool in the west and Leeds in Yorkshire in the northeast) suffered high unemployment and declines in property values. Bennett himself comes from the North and has always had an affinity for the Labour Party's socialist inclinations. While Talking Heads never addresses either politics or economics, its tone is meant to convey a subtle criticism of the establishment (witness Susan's cracks about life in the Church of England) and of attitudes toward the poor (such as Doris' meager life in retirement). As entertainment, the Studio Theatre's presentation of Talking Heads cannot be faulted. It is a real gift to the Washington community, making concrete Lesley's comment about her own aspiring profession: "Acting is really just giving." Talking Heads continues through April 7 at the Studio Theatre, 1333 P Street, N.W. Performances are Wednesday and Thursday at 8:00 p.m., Saturday at 2:00 p.m., and Sunday at 2:00 and 7:00 p.m. (tickets $18.50 and $23.50). Friday and Saturday evening performances (8:00 p.m.) are $24.50 and $29.50. For ticket information, call 202-332-3300. VFH, he added, has recently begun to include Virginia’s Native Americans in its programs. Guest Post: Why is sarcasm so difficult to detect in texts and emails? This sentence begins the best article you will ever read. Chances are you thought that last statement might be sarcasm. Sarcasm, as linguist Robert Gibbs noted, includes “words used to express something other than and especially the opposite of the literal meaning of a sentence.” A form of irony, it also tends to be directed toward a specific individual. However, it’s not always easy to figure out if a writer is being sarcastic – particularly as we march ahead in a digital age that has transformed the way we communicate, with texting, emailing and online commentary replacing face-to-face chats or phone conversations. Friend: I’m waiting at the front. Movie starts in 5. You: I’m on my way now. Should be there in 10. Friend: I’m glad you were watching the clock today. Was the friend being sarcastic or sincere? The later you are, the more upset they’ll likely be, and the higher the probability their response is a sarcastic jab. But if your friend knows you’re usually much later, they could be sincere. So there’s one thing to look for: How well does the attitude the writer is conveying agree with the situation and the person? Nonetheless, the struggle to interpret written sarcasm is real. Studies have shown that people realize that they have a tough time interpreting sarcasm in writing. Studying the use of email, researchers found writers who think they’re being obviously sarcastic still confuse readers. Sarcasm thrives in ambiguous situations – and that’s the main issue. When delivered in person, sarcasm tends to assume a cutting, bitter tone. But written messages don’t always get that attitude across or give you much else to go on. We still need more information. The problem is that a lot of previous studies of sarcasm have been done on spoken sarcasm, which tends to give listeners cues. When you have a conversation with someone face-to-face (or FaceTime-to-FaceTime) and they say something sarcastic, you’ll see their facial expression, and they may look slightly bemused or tense. Equally or more helpful, the tone of their voice will likely change, too – they may sound more intense or draw out certain phrases. You’ll also be firmly grounded in the real-time context of the situation, so when they say, “Man, nice job ironing your clothes,” you can look down – and see your wrinkled shirt. All of these cues have been researched, and we know enough about them that we have the ability to artificially make a sincerely spoken statement sound sarcastic. And yet when we text, a lot of that information goes missing. There are no facial cues, no vocal tones and maybe even a delayed response if a person can’t text you back immediately. And if you don’t know the person all that well, there goes your last potential cue: history. So after what you thought was an unexceptional first date – exactly how do you interpret the following flurry of texts? Was the date really that good? Did they really seem like they had that much fun? Or are they just a jerk lamenting the wasted time? All valid questions. And the recipient could come to a lot of conclusions. Fear not. The digital age has developed some ways to mitigate some of the tortuous ambiguity. You can probably include an emoji to make it clearer to a reader something was meant sarcastically. Ambiguity reduced, and facial expression taken care of. Probably not headed for date #2. If we’re talking about email, we also have modifications that that can be made to text. We can italicize or bold words to change the way that a reader interprets the message. Lastly, social media platforms like Twitter have given writers even more tools to allow people to communicate their intent. A study that included sarcastic tweets found that tweeters who include the hashtag #sarcasm tend to use more interjections (wow!) and positive wording for negative situations in their sarcastic tweets. Algorithms have actually been built to determine the presence of sarcasm and rudeness in tweets, user reviews and online conversations. The formulas were able to identify language that’s outright rude pretty easily. But in order to correctly detect sarcasm, researchers found that algorithms need both linguistic (language) and semantic (meaning) information built in. In other words, sarcasm’s subtlety means that the algorithms require more specification in their coding – unless you #sarcasm, of course. With so many options to choose from, it’s time to make sure that text you send at 2:30 a.m. really gets your point across 😉. Starting with this weekend's episode, I am the host and producer of "The Score," a podcast featured on the news and politics web site Bearing Drift. "The Score" is also broadcast over the airwaves on WINC 1400 AM and WINC 104.9 FM in Winchester, Virginia. In addition, “The Score” can also be heard around the world on Red State Talk Radio Network, its affiliates, and on its Roku channel and free Android app. 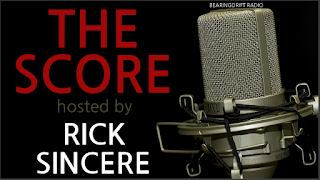 This week's guests on "The Score" are Elliott Harding, former legislative director for Congressman Tom Garrett (R-VA5), who talks about a bill that would reduce students' debts in return for their deferring retirement; Libertarian Party nominee for the U.S. Senate Matt Waters; and Marian Tupy of the Cato Institute, who answers my questions about Africa's economic future. If you're in the vicinity of WINC's AM and FM signals, you can listen to "The Score" at 7:00 o'clock on Saturday morning, preceded by "America This Week" and followed by "In the Garden with Andre Viette." Hosting a radio show has long been an ambition of mine. It probably dates to my earliest days listening to talk radio in Milwaukee as a teenager. Back then it was a late-night program on WEMP-AM hosted by Ira Fistell. His mix of interviews with authors and celebrities with listener call-ins was still new in the early 1970s (before the FCC repealed the "fairness doctrine") but it set a standard for me. I also appreciated and learned from Joey Reynolds' laid-back, conversational style manifested in his longtime overnight program from WOR-AM in New York City. Because, really, what is an interview but a form of conversation? In my career as a public policy analyst, author, and activist, I have been a guest on more radio and TV programs than I can count, in studios from Las Vegas to New York to Johannesburg and by phone across North America and around the world. In the early 1990s, I was co-host of a cable access show in Arlington, Virginia, called "Politics: Landry vs. Sincere" and I was a correspondent, book reviewer, and anchor on "Gay Fairfax," a news magazine show originating in Northern Virginia but bicycled to cable systems throughout the Mid-Atlantic. Readers of this web site will recall that, in July 2015, I sat in for host Coy Barefoot on WCHV-FM while he was on vacation. Later that year, I auditioned to take over the afternoon drive-time program on that same station. I have been contributing interview segments to "The Score" since I began writing for Bearing Drift in late 2011, with spots featuring Virginia politicians like former governors George Allen, Bob McDonnell, and Doug Wilder; Senators Tim Kaine, Mark Warner, and Jim Webb; and Members of the House of Representatives like Eric Cantor, Tom Garrett, Bob Goodlatte, and Robert Hurt -- not to mention numerous candidates for public office, members of the General Assembly, and authors and experts on public policy issues. (Scroll through "The Score" archive to track those down.) My thanks to former host Scott Lee and former producer Norm Leahy for those opportunities. In addition to all this, I have been a happy participant in the weekly political roundtable on Coy Barefoot's "Inside Charlottesville" show on 94.7 WPVC-FM, along with fellow panelists Jackson Landers and Shaun Kenney. You can listen to us live on Monday afternoons at 5:00 o'clock. There's a livestream of the program and it is also archived as a podcast on InsideCville.com. The past week has been a whirlwind as I taught myself the basics of editing a 55-minute radio program but I hope the result is easy listening to provocative and timely interviews that inform our audiences and stimulate their conversations. One aim: to syndicate the show to more broadcast stations, not just in Virginia but elsewhere in the United States, too. If your favorite radio station could use some fresh content, please recommend "The Score" to its program director. I wandered the streets of Galway, on St Patrick’s Day 2002, wearing a t-shirt which stated “St Patrick: he’s Welsh, you know”. It was intended, and received, as friendly banter, in the context of a resounding Irish victory over Wales in the Six Nations rugby tournament a fortnight previously. But is it true? The answer should be pretty straightforward. After all, Patrick tells us, in one of the two Latin works of his that have survived, where he was from: a town named Banna Venta Berniae. Unfortunately, we don’t know where that was, except that it was somewhere in Britain. As he was captured there by Irish raiders, it must have been reasonably close to the west coast of Britain. So it is quite possibly, but by no means necessarily, somewhere in Wales. Perhaps its precise location doesn’t really matter. In Patrick’s lifetime (some time in the fifth century AD), Wales, as we know it, did not exist. The inhabitants of the various kingdoms which made up the geographical area which we now call Wales called themselves “Britons”, as indeed did many other people in the part of Britain south of Hadrian’s Wall – the old Roman province of Britannia. But those Britons who spoke the British Celtic language known as Brittonic (the ancestor of Welsh, Cornish and Breton) began, in the same century, to use another name for themselves?, Combrogī – “fellow countrymen”. This term is the ancestor of the English place name Cumbria, and of the word the Welsh use today to describe themselves: Cymry (in the Middle Ages, this term was also used for the country of Wales, which is now spelled Cymru). Whether or not this term was in use in the fifth century, however, is impossible to say. By this time, Germanic-speaking kingdoms were forming in the south and east of the island of Britain. They were the forerunners of what historian, and later saint, Bede, in the eighth century would call the “gens Anglorum”, “the English people”. These people were not Britons, either to themselves, or to their neighbours to the west, who, then and now, called them “Saxons” (Welsh “Saeson”, Gaelic “Sasanaigh”). They, in turn, called the Britons, “Wealas”, the origin of the word “Welsh”. So from a contemporary English point of view at least, Patrick would have been Welsh. It has been claimed, by scholars both medieval and modern, that St Patrick spoke Brittonic. We know that he could write good Latin, but he called it lingua aliena, “a foreign language”. It was not his native tongue, but, as a high status language with a venerable literary tradition, and the lingua franca of the church, it was the obvious choice for him to write in. Without any further evidence, we could quite confidently deduce that Brittonic would be his native tongue (Irish, English and Pictish are much less likely candidates for a native of western Britannia at this time). But perhaps we can go further than this. In the seventh century, an Irish monk named Muirchú wrote a Life of St Patrick in Latin. In it, the few historical facts about Patrick recoverable from his own writings are almost completely obscured by the numerous miracles that were de rigeur in medieval writings on the lives of saints, and the blatant propaganda of the ambitious church of Armagh, which was in the process of appropriating Patrick for itself. St Patrick depicted in stained glass at St Benin’s Church, County Galway. Nonetheless, Muirchú records verbatim two of Patrick’s sayings: “modebroth” and “gra(t)zacham”. Muirchú does not tell us what language these utterances are in, but both were interpreted as being in Brittonic by a ninth-century Irish lexicographer, Cormac mac Cúilennáin, the bishop-king of Cashel. Modebroth, he claimed, is a corrupt form of the Welsh “myn duw brawd” – “by the god of judgement”. This could be right, but gra(t)zacham derives ultimately from the Latin “gratias agam” (“let me give thanks”), or gratias agamus (“let us give thanks”). Cormac seems to have interpreted it as Brittonic on the eminently reasonable ground that Patrick was a Briton, and that anything he is reported to have said which was not obviously Irish or Latin must have been Brittonic. So if he was wrong about gra(t)zacham, he may have been wrong about modebroth, too, which may, in fact, have been an Irish phrase meaning “divine judgment”, subjected to the sort of modification common in religious oaths (see, for instance, the English “gosh” and “jeepers” instead of “God” and “Jesus”). At any rate, there is no very compelling reason to believe that Muirchú really did have access to the exact words which Patrick had uttered 200 years previously. So what’s the verdict? Patrick may very well have been born in present-day Wales. He was certainly born in the west of Britain. He may have thought of himself as a Cymro, and the English would doubtless have classified him as Welsh. His first language was almost certainly the ancestor of Welsh. And yet, we know that he chose Ireland over the land of his birth. He is a footnote in the history of Wales, but utterly central to that of Ireland. In the game of rugby which inspired my St Patrick’s Day t-shirt, one of the (many) try scorers for Ireland was a certain Ronán O’Gara, born San Diego, California. When it comes to identity, place of birth isn’t everything. On March 17, people around the world will celebrate St. Patrick’s Day by parading in green hats, sporting images of shamrocks and leprechauns – tiny, grinning, fairy men – pinned to their lapels. Patrick’s picture will adorn greeting cards: an aged, bearded bishop in flowing robes, grasping a bishop’s staff and glaring at a coil of snakes. The icon refers to one of Patrick’s legendary miracles in which he is said to have prayed to banish all snakes from Ireland. However, as a historian of medieval Ireland, I can assure you that the real St. Patrick, who lived and worked in the fifth century, never saw a snake or wore a shamrock. Patrick’s own writings and early accounts of the saint’s career reveal many interesting details about the life of this patron saint of Ireland. Here are 10 things you may not know about St. Patrick. Patrick was born around 450 A.D., just when Roman troops withdrew from Britain. His father was a gentleman and a Christian deacon who owned a small estate in a place called Bannavem Taburniae. Scholars aren’t sure where this place was – it was probably on the west coast around Bristol, near the southern border of modern Wales and England. Irish slave traders sailed the waters off that same coast, and one day they came ashore to capture the teenage Patrick and his neighbors, to sell back in Ireland. Patrick spent six years tending sheep in the west of Ireland. While chasing sheep on the hills, Patrick prayed a hundred times a day, in all kinds of weather. It paid off. One night a mysterious voice called to him, saying, “Look, your ship is ready!” Patrick knew he wasn’t hearing sheep. The time was right for his escape. St. Patrick Catholic Church, Ohio. Patrick had other peculiar visions, too. Back home at Bannavem Taburniae, he was visited by an angel with a message from the Irish: “We beg you, Holy Boy, to come and walk again among us.” He trained as a bishop and went back to Ireland. Years into his mission, someone, it seems, told a dirty secret about Patrick to his fellow bishops. “They brought up against me after thirty years something I had already confessed … some things I had done one day - rather, in one hour, when I was young,” he wrote. Patrick did not tell us what he did – worship idols? Engage in a forbidden sexual practice? Take gifts from converts? Whatever it was, Patrick retrospectively understood his zealous Irish mission to be penance for his youthful sins. While he spread Christianity around Ireland, he was often beaten, put in chains or extorted. “Every day there is the chance that I will be killed, or surrounded, or taken into slavery,” he complained. Two centuries after his death, Irish believers wanted more exciting stories of Patrick’s life than the saint’s own account. One legend (written 700 A.D.) described Patrick’s contest with native religious leaders, the druids. The druids insulted Patrick, tried to poison him and engaged him in magical duels – much like students of Harry Potter’s Hogwarts – in which they competed to manipulate the weather, destroy each other’s sacred books and survive raging fires. When one druid dared to blaspheme the Christian God, however, Patrick sent the druid flying into air – the man dropped to the ground and broke his skull. Another legend from around the same time tells how Patrick fasted for 40 days atop a mountain, weeping, throwing things, and refusing to descend until an angel came on God’s behalf to grant the saint’s outrageous demands. These included the following: Patrick would redeem more souls from hell than any other saint; Patrick, rather than God, would judge Irish sinners at the end of time; and the English would never rule Ireland. We know how that last one worked out. Perhaps God will keep the other two promises. None of the early Patrician stories featured the shamrock – or Irish seamróg – which is a word for common clover, a small plant with three leaves. Yet children in Catholic schools still learn that Patrick used a shamrock as a symbol of the Christian Trinity when he preached to the heathen Irish. As for the miraculous snake-charming attributed to Patrick, it could not have happened because there were no snakes in pre-modern Ireland. Reptiles never made it across the land bridge that prehistorically linked the island to the European continent. Most likely, the miracle was plagiarized from some other saint’s life and eventually added to Patrick’s repertoire. Party-goers on March 17 need not worry about ancient historical details, though. Whatever the truth of Patrick’s mission, he became one of the three patrons of Ireland, along with Sts. Brigit and Columba– the latter two were born in Ireland. Wishing you “Lá fhéile Pádraig sona dhaiobh” – Happy Saint Patrick’s Day. The question of how we know about her is a relatively simple one. She appears in a number of early Christian texts associated with the ministry of Jesus. These texts comprise Gospels written in the first and second century of the Common Era (CE). The earliest of them are included in the New Testament, where Magdalene plays a significant role. She also appears in later Gospels, which were not included in the Bible and come from a later period in early Christianity. The answer about who she was and what we know of her is more complex. In Western art, literature and theology, Mary Magdalene is portrayed as a prostitute who meets Jesus, repents of her sins, and pours oil on his feet in a gesture of humility, penitence and gratitude. She is sometimes depicted kneeling at the foot of the cross, hair unbound, emphasising the sinful past from which she can never quite escape, despite being declared a saint. The tradition of the penitent prostitute has persisted in the Western tradition. Institutions that cared for prostitutes from the 18th century onwards were called “Magdalenes” to encourage amendment of life in the women who took refuge in them. The word came into English as “maudlin”, meaning a tearful sentimentality. It is not a flattering description. Titian’s Penitent Magdalene, circa 1565. Artistic depictions continued to emphasise Magadelene’s sexuality in various ways, under a facade of piety. In another twist on the same theme, she is presented as the wife of Jesus, most notably in Dan Brown’s The Da Vinci Code (2003). The tradition of Mary Magdalene as the archetypal penitent whore, whose sexuality somehow manages to persist beyond her conversion, can be dated to a sermon preached by Gregory the Great in the sixth century CE. Admittedly, there are a confusing number of women called “Mary” in the Gospels and we might assume Pope Gregory was tired of distinguishing between them. He reduced them to two: on the one hand, Mary, the mother of Jesus, perpetual virgin, symbol of purity and goodness, and, on the other, Mary Magdalene, promiscuous whore, symbol of feminine evil from which the world must be redeemed. Yet nowhere in the Gospels is Mary Magdalene associated either overtly or covertly with sexuality. The four Gospels of the New Testament present her in two significant roles. In the first place, she is a disciple of Jesus: one among a band of women and men from Galilee who believed in his message of love and justice and followed him in his ministry. Secondly, Magdalene is a primary witness in the Gospels to the resurrection of Jesus from the dead. Unlike many of the other disciples, she does not flee when Jesus is arrested. She remains at the cross when he dies and later visits his tomb to find it empty, with a vision of angels declaring his resurrection. Mark’s Gospel, which we now know to be the earliest Gospel to be written, speaks of Magdalene as a disciple of Jesus who has followed him from Galilee along with other women, but it does not mention her until the crucifixion. These women disciples now stand near the cross, despite the danger in being present at the execution of a dissident. Three of them, including Magdalene, visit the tomb on Easter morning where they meet an angel who informs them that Jesus has risen from the dead (Mark 16:1-8). The women’s subsequent departure from the tomb is ambiguous, and they leave in fear and silence, which is where the manuscript of Mark’s Gospel abruptly ends. An ending added later makes mention of the risen Jesus making an appearance first to Magdalene. In Matthew’s Gospel, Magdalene meets the risen Christ as she leaves the tomb, this time with only one other female companion, who is also called “Mary” (Matt 28:1-10). In Luke’s account, Magdalene appears at the cross and at the empty tomb to hear the angel’s words, but she and her female companions are not believed when they convey the message of the resurrection to the apostles (Luke 24:1-11). Mary Magdalene anoints Christ’s feet in Dieric Bouts’ Christ in the House of Simon (circa 1420–1475). In Luke, there is an earlier mention of Magdalene in Jesus’s ministry where she is present, along with other women, as a disciple and supporter of Jesus (Luke 8:1-3). She is described as having had seven demons cast from her. This description might lead to the conclusion, in some minds, that the many “demons” refer to her unfettered sexuality. But that would be erroneous. Exorcisms — the casting out of evil spirits — are common in the first three Gospels. Those suffering demonic possession are never described as sinful but rather are victims of external evil. These days, we would associate their symptoms with physical maladies such as epilepsy or mental illness. Magdalene, in other words, has been the victim of a serious illness and Jesus has healed her. Furthermore, the description is unusual here in that she is not described in relation to a male figure, as other women at the time generally were: father, husband, brother. She is simply referred to as “the Magdalene”, that is, the woman from Magdala, a Jewish village in Galilee. We might well assume, from Luke’s description, that she is an independent woman of some means, who is well able to fund, as well as participate in, the movement around Jesus. John’s Gospel, however, gives Magdalene her most significant role. Once again, she does not appear until the crucifixion. In the narrative that follows, she comes alone to the tomb on Easter morning, finds it empty, tries unsuccessfully to gain help from two other prominent disciples, and eventually meets the risen Christ himself in the garden (20:1-18). He is alive and commissions her to proclaim the message of his resurrection. On the basis of John’s story, later tradition gave Magdalene the title of “apostle to the apostles” and recognised something of her significance for Christian faith, witness and leadership. A tragic consequence is that her role as witness to the resurrection was later overshadowed by the apparently more alluring but inaccurate picture of her as the penitent whore. A more accurate portrayal of Mary Magdalene announcing the risen Christ from the 12th-century English illuminated manuscript St Albans Psalter. The later Gospels, beyond the New Testament, also emphasise Magdalene’s importance as a disciple of Jesus and witness to the resurrection. The manuscript of the Gospel of Mary, which describes her discussions with the risen Christ, is unfortunately damaged and the central section is missing. In this and other similar Gospels, however, Magdalene is presented as the favoured disciple. This situation leads to some tension with the other disciples, who are jealous of her closeness to Jesus and the teaching she alone is given. One Gospel speaks of Jesus kissing her, but the imagery in the Gospel of Philip is metaphorical and refers to a spiritual union with Christ. In response to the objection by the other disciples, Jesus asks why he does not kiss them in the same way, implying that they do not as yet possess the same degree of spiritual knowledge. There is no evidence, incidentally, that Magdalene ever anointed Jesus. There are three anointing traditions in the Gospels. In one, an unnamed woman anoints Jesus’s head in prophetic recognition of his identity (Gospels of Mark & Matthew). In another, a named and known disciple, Mary of Bethany, who is a model disciple, anoints Jesus’s feet in gratitude for his raising her brother Lazarus from the dead (Gospel of John). In the third, a “sinful woman”, who is not explicitly identified as a prostitute, anoints Jesus’s feet in a gesture of repentance, gratitude and hospitality. None of these three figures is associated in any way with Mary Magdalene in the texts. The movie Mary Magdalene, directed by Garth Davis, is a significant portrayal of this early Christian figure in the light of evidence from the earliest texts. The screenwriters, Helen Edmundson and Philippa Goslett, are quite clear that Mary is not to be associated with Jesus through her sexuality, either as harlot or wife. On the contrary, she is depicted as a faithful and deeply insightful disciple of Jesus, on whom he draws for his message of love, mercy and forgiveness. Magdalene is beautifully portrayed in the movie, which draws on traditions from the earlier and later Gospels. She possesses an intense and compelling presence, which does much to restore her character from its later distortions. It is true that the film makes somewhat erratic use of the New Testament, both in its presentation of Magdalene and of other characters in the story. Towards the end, for example, there is an implication that Magdalene and the church stand on opposite sides, the one in sympathy with Jesus’s teaching and the other anxious to build a self-glorifying edifice on his assumed identity. This is unfortunate, as the New Testament itself is quite clear about the priority and identity of Magdalene as a key disciple, witness and leader in the early church, without seeing her in opposition to others. Indeed, those who campaigned in a number of Christian churches for the ordination of women in the 20th century used precisely the example of Mary Magdalene from the New Testament as “apostle to the apostles” to support their case for women’s equality and leadership. The recent installation of Kay Goldsworthy as Archbishop of the Anglican Diocese of Perth — the first woman in this country and across the world to be given this title — is the true heir of Magdalene as she is portrayed in the earliest Christian writings. The film Mary Magdalene opens in Australian cinemas on March 22.